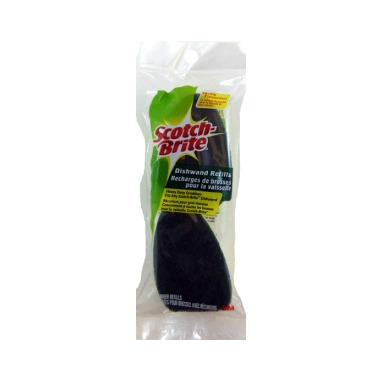 With the Scotch-Brite Dishwands you think you are in a fairytale come true. Your pots & pans will sparkle and thanks to the dishwand your hands will be out of the mess! Tapered scouring head allows access to nooks and crannies. Great heavy duty scrubber that lasts a while. I use it to clean my shower and sinks! I wash my dishes with a sponge-on-a-stick. The stick blasts through soap way too fast, so I use a little dippin' dish on the back of the sink instead. The sponge part of the sponge-on-a-stick is great though, lets me wash dishes like a champion. A champion dish washer... where the prize isn't even a participation ribbon. I've converted over to these fully! Makes washing up much easier and saves me putting my hands fully in the gross dishwater! Always hated that part! Better than using a normal sponge but it dispenses a lot of soap. Very happy with this sponge. You can get anything off with it! Yup -- work perfectly well. I'm totally brand-loyal on these, and have been for years.